Matthew Harrison has a background in agriculture. 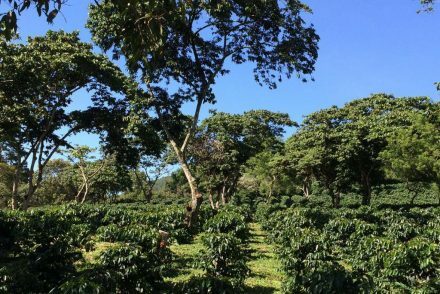 And while he’s spent extensive time in the coffee fields, he now lives in the coastal city of Dar es Salaam, focusing on field operations and the trading side of the business for GO sister organization Taylor Winch. Last week, he stepped away from the cupping table to chat about coffee, culture and why there’s no such thing as a signature drink from Tanzania. There was good news from Tanzania last Thursday. While the Kilimanjaro region in the north receives two rainy seasons, in the south of the country, around Mbeya and Mbinga, one rainy season is the norm. And it had just ended. “Mbinga’s had very heavy rainfalls this year, and it’s been a challenge for sure. Some of the roads are just impassable — they look like rivers,” said Matthew Harrison, assistant general manager at Taylor Winch, GO’s sister operation in Tanzania. The rain had started in October, Harrison explained, bringing about a flowering. 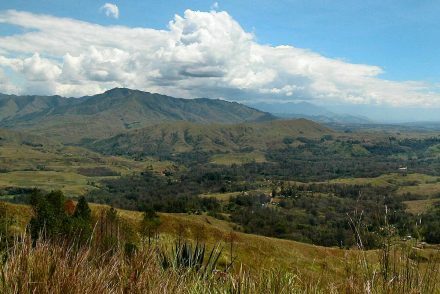 The rains encouraged the growth of cherries, which will finish and ripen during the next few sunny weeks, and then the harvest will run, depending on altitude, through June, July and August. Coffee Berry Disease (CBD) is a challenge this year in Mbinga, due to a prolonged rainfall. A challenge now for the Volcafe Way field teams will be to help prevent outbreaks of leaf rust. Also challenging, Harrison continued, is that treating coffee trees for leaf rust means preventatively spraying “agrochemicals” before the disease arrives. Which the farmers, low on cash, aren’t eager to do. 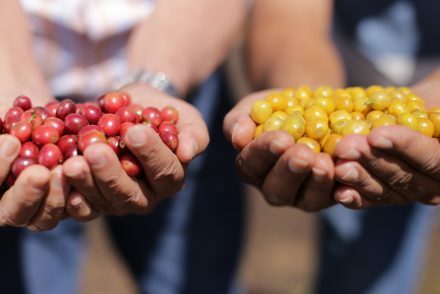 While many producers are second- and third-generation coffee growers, the culture of coffee in much of Tanzania is that a son won’t become involved with the farm until his father passes away. So there’s not much of a knowledge transfer. Matthew Harrison (far left) and Volcafe Way’s Elizabeth Mbau (third from right) with model farmer Maternus Nombo and AMPCG board members at a model farm in Mbinga. As for ways that farmers might increase their yields and make more money, Harrison explained that, foremost, there’s a culture to respect. The exception tends to be women. “The women-run farms tend to be the best that we find. And again, it’s a cultural thing. Women here generally do all the work,” Harrison explained. When it comes to the coffees of Tanzania, it’s essential to understand the size of the country — think Texas and New Mexico combined. There is no singular Tanzania style — coffees from different regions could well be coffees from different countries. Which means very different cup profiles. 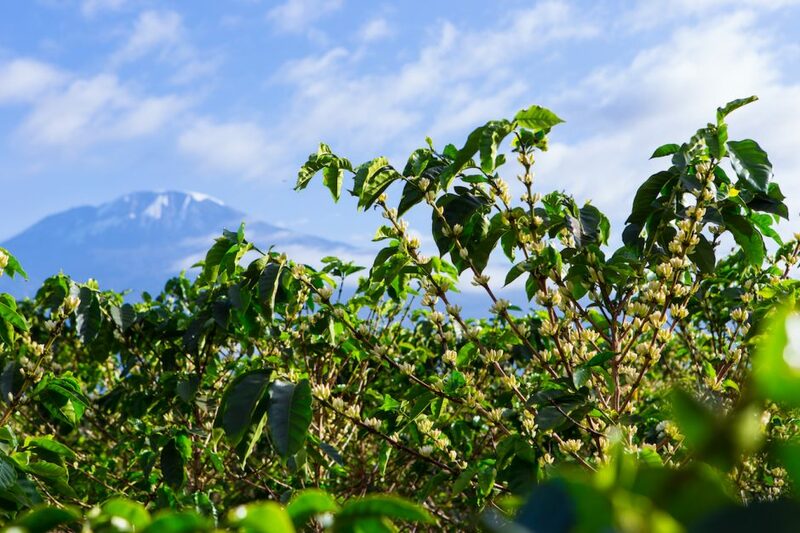 “The typical Kilimanjaro coffee has quite a heavy body. It has chocolate and caramel sort of flavors, with acidic notes similar to that of a Kenyan coffee. It’s like a little brother of the Kenya coffees,” Harrison grinned. Taylor Winch assistant general manager Matthew Harrison. Then there are Mbeya and Mbinga. How to experience these coffees? *Mbeya is in! Click to order a box or request a free sample!